This set includes 18 cards containing verbs along with a spinner and recording page. Print and laminate the verb cards and place in a basket or a stack. Students use a paperclip and their pencil to create a spinner. 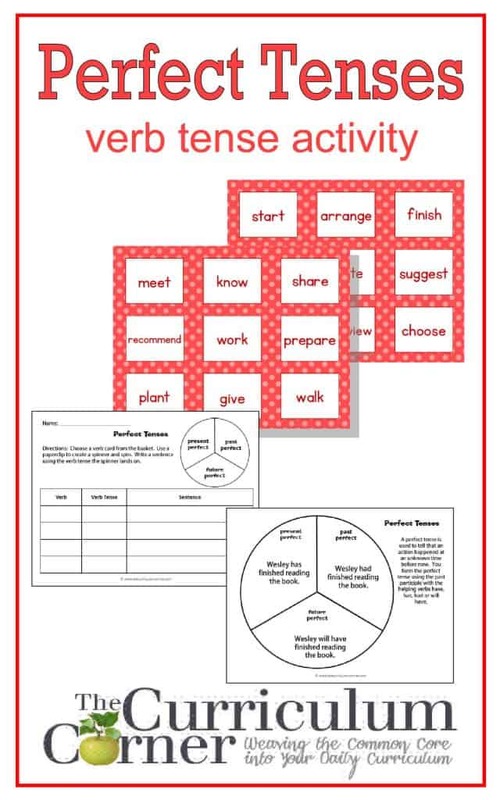 They will choose a verb card, spin and then write a sentence using the verb and the tense they landed on. We have also included a guide to creating the perfect tense for students who need assistance. CCSS.ELA-LITERACY.L.5.1.B Form and use the perfect (e.g., I had walked; I have walked; I will have walked) verb tenses.